Glenn Edward "Bo" Schembechler Jr. (/ˈʃɛmbɛklər/ SHEM-bek-lər; April 1, 1929 – November 17, 2006) was an American football player, coach, and athletics administrator. He served as the head football coach at Miami University from 1963 to 1968 and at the University of Michigan from 1969 to 1989, compiling a career record of 234–65–8. Only Nick Saban, Joe Paterno and Tom Osborne have recorded 200 victories in fewer games as a coach in major college football. In his 21 seasons as the head coach of the Michigan Wolverines, Schembechler's teams amassed a record of 194–48–5 and won or shared 13 Big Ten Conference titles. Though his Michigan teams never won a national championship, in all but one season they finished ranked, and 16 times they placed in the final top ten of both major polls. 3.1 "Those Who Stay Will Be Champions"
In 1963, Schembechler returned to Miami University to become head coach of his alma mater. Over the next six seasons, Schembechler led the Redhawks to a 40–17–3 record, winning a pair of Mid-American Conference titles and finishing second three times. The team's top season was 1966, as Miami went 9–1 overall. Miami's offense was led during those seasons by quarterbacks Ernie Kellerman and Bruce Matte. Schembechler's greatest victory came in his first season, when he led the Wolverines to an upset victory over a standout Ohio State team coached by his old mentor, Woody Hayes. Hayes' Buckeyes dominated the series during the late 1950s and for most of the 1960s as Michigan fielded a number of uncharacteristically mediocre teams. In 1968, the year before Schembechler became head coach, Hayes made it clear how far Michigan had fallen behind its traditional rival, when the Wolverines lost 50–14. At the end of the game, Hayes decided to pursue a two-point conversion rather than a simple kick for an extra point. Legend has it[weasel words] that when Hayes was asked why he "went for two," he responded, "because they wouldn't let me go for three." The embarrassment of that outcome set the stage for the 1969 rematch. Schembechler was also the athletic director at Michigan from 1988 until early 1990. Just before the 1989 NCAA Basketball Tournament, men's basketball head coach Bill Frieder announced that he was taking the head coach position at Arizona State University, effective at the end of the season. Insisting on those in the program being dedicated to the school, Schembechler immediately fired Frieder and appointed assistant basketball coach Steve Fisher as interim head coach, while famously announcing that "a Michigan man is going to coach a Michigan team" in the NCAA tournament. The literal meaning of the Schembechler's quote was that only a current, 100 percent-committed university employee would coach the team, not Frieder, whose loyalties had just switched to Arizona State. Ironically, Frieder was an alumnus of Michigan, while Fisher was not. Fisher led Michigan to six straight victories in the tournament and the 1989 national championship. Schembechler witnessed the championship game, an 80-79 overtime cliffhanger vs. Seton Hall, two days after his 60th birthday (the semifinal victory over Big Ten rival Illinois was played on Schembechler's birthday). Steve Fisher graciously submitted Bill Frieder's name to receive the championship ring, however someone, likely from Schembechler's administration, removed his name. Schembechler would coach Michigan's Rose Bowl team in 1990 while having secretly accepted the role of President for the Detroit Tigers, publicly announcing the hire after the game. The University's Regents approved a plan for the renovation and expansion of Michigan Stadium on the day of Schembechler's death. On November 21, 2006, the University of Michigan held a memorial service for Schembechler in Michigan Stadium. Approximately 20,000 fans, ex-players and coaches including former Schembechler player and assistant coach and then LSU head football coach Les Miles turned out during the middle of a work-day to pay their respects to Schembechler and to celebrate his life. Former Ohio State head coaches Earle Bruce and John Cooper attended, along with then Ohio State head coach Jim Tressel and his entire staff. Schembechler is interred at Forest Hill cemetery in Ann Arbor, Michigan. Before his death, Schembechler had agreed to be an honorary pallbearer for former Michigan Wolverine and University of Michigan alumnus President Gerald Ford. Ford, himself a center at Michigan in the 1930s, died on December 26, 2006. A pew inside Washington National Cathedral was draped with a University of Michigan stadium blanket in Schembechler's memory. After Schembechler married Mildred (Millie) in 1968, he adopted her three sons: Donald (Chip), Geoffrey and Matthew. Schembechler and Millie then had a son together, Glenn III (Shemy). ^ "Schembechler collapses, dies at 77 – College Football – ESPN". Sports.espn.go.com. November 19, 2006. Retrieved February 5, 2015. ^ Richards, Gregory B. and Larson, Melissa H.: Big-10 Football, page 95. Crescent Books, 1987. ^ "Sunday night NFL options hardly must see TV". Nctimes.com. Retrieved February 5, 2015. ^ "1980 Michigan Wolverines Schedule and Results". College Football at Sports-Reference.com. Retrieved November 26, 2017. ^ "The forgotten man of Michigan's '89 title". The San Diego Union-Tribune. Retrieved January 31, 2016. ^ "Those who stay will be champions". The Michigan Daily. November 18, 2006. Archived from the original on November 6, 2014. Retrieved February 5, 2015. ^ "Schembechler chronology". The Argus-Press. Associated Press. December 15, 1989. Retrieved December 3, 2011. ^ McKenna, Dave (October 27, 2016). "The Writer Who Was Too Strong To Live". Deadspin. Retrieved November 26, 2016. ^ Newhan, Ross (August 4, 1992). "Bo Gets Ax by Fax : Tigers' Message to Schembechler: You're Fired". LA Times. Retrieved January 3, 2012. ^ "University of Michigan". Umich.edu. March 17, 2005. Retrieved February 5, 2015. ^ "ESPN – Schembechler collapses, dies at 77 – College Football". Sports.espn.go.com. November 19, 2006. Retrieved February 5, 2015. ^ Guest (January 8, 2009). "Sports –". Comcast.net. Retrieved February 5, 2015. ^ Bacon, John (November 17, 2007). "Bo's lasting lessons: A coach to the end". The Detroit News. ^ "Report: Michigan legend Schembechler hospitalized again". ESPN. November 17, 2009. Retrieved September 9, 2009. ^ a b "Video". CNN. November 27, 2006. ^ a b "UM vs OSU Woody vs Bo". Bentley.umich.edu. Retrieved February 5, 2015. ^ "2016 BGSU Football Media Guide" (PDF). Bowling Green State University. 2016. pp. 137, 141. ^ a b c d "1987 Football Team – University of Michigan Athletics". Bentley.umich.edu. March 31, 2007. Retrieved February 5, 2015. ^ a b c "1977 Football Team – University of Michigan Athletics". Bentley.umich.edu. March 31, 2007. Retrieved February 5, 2015. ^ Meisler, Natalie (November 22, 2010). "Buffs, Huskers going separate ways after seeing their series turn serious". Denver Post. ^ a b c d e "1970 Football Team – University of Michigan Athletics". Bentley.umich.edu. March 31, 2007. Retrieved February 5, 2015. ^ "1990 Football Team – University of Michigan Athletics". Bentley.umich.edu. March 31, 2007. Retrieved February 5, 2015. ^ "1980 Football Team – University of Michigan Athletics". Bentley.umich.edu. March 31, 2007. Retrieved December 26, 2016. 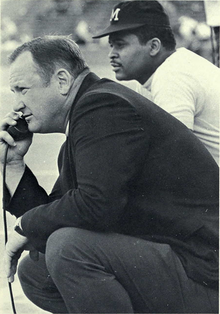 Wikimedia Commons has media related to Bo Schembechler.